But idk what to blog about. I'm watchin' AFV right now. So uhm, yeah. Funny stuff lolz. I wanna eat... uh, idk. There's a bunch of things I wanna eat haha. So... Twitter has been weird for everyone. But it's fine for me haha. But David says his twitter also has something wrong. Speaking of David's twitter, did you know that it's verified now? His account, I mean lol. 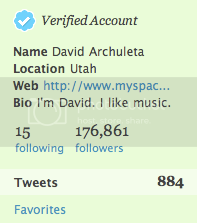 Haha I've been wonderin' when it'd get verified... Haha I love his bio!! "I'm David. I like music."